I know this may come as kind of a shock to some of you, but chocolate cake isn’t one of my favorite things in the world. If given the choice, I always pick vanilla cake. But, after discovering Beatty’s Chocolate Cake (Blackout cake? Whatever you want to call it!) my views began to shift. 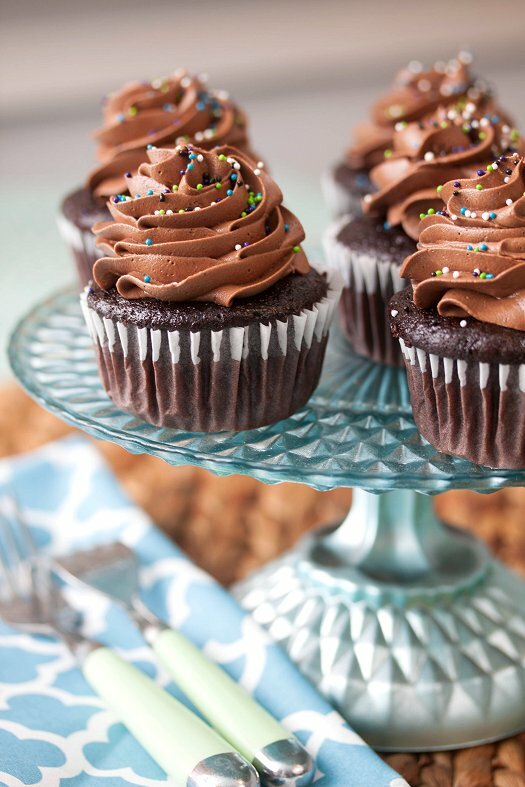 I’ve been looking for a good chocolate cupcake recipe – that was easy, baked up well, held up to frosting, but was still (and most importantly) moist and delicious. This recipe definitely fits the bill! With the addition of buttermilk, cocoa, espresso powder and hot water – it’s totally reminiscent of my favorite chocolate cake recipe. But held it’s shape and is a bit denser, which is just what I was looking for in cupcake form. For the frosting, it’s a standard buttercream in which plenty you add plenty of melted unsweetened chocolate too. That leads to a frosting that is rich and chocolatey, but not cloyingly sweet. This recipe is for 12 cupcakes, but could easily be doubled to dole out 24. Which, I’m sure will be happening in my kitchen next time. A truly perfect chocolate cupcake, kids. Another one for the books! Preheat oven to 350. Line a muffin tin with cupcake liners and set aside. In the bowl of a stand mixer fitted with a paddle attachment combine flour, sugar, cocoa, baking powder, baking soda, salt, and espresso powder. Add milk, vegetable oil, eggs, and vanilla to flour mixture and mix together on medium speed until well combined. Reduce speed and carefully add boiling water to the cake batter. Beat on high speed for about 1 minute to combine well. Fill cupcake liners about 2/3 of the way full. For the frosting, melt the chocolate in a double boiler. Beat butter until fluffy. Carefully add the confectioners’ sugar, vanilla, and salt and beat until no lumps remain. With the mixer on low, slowly add the chocolate and mix until combined. If frosting is too thick, add a splash of milk to reach desired consistency. Source: cupcakes adapted from Add A Pinch, frosting adapted from Williams-Sonoma. Chocolate cake isn’t one of my favorite things in the world either, but I could be convinced…! Beatty’s chocolate cake is so divine! It’s my family’s favorite and I could just devour that cake all alone. Your cupcakes look wonderful! These look so good! One question…the unsweetened chocolate for the frosting…you melt it before adding to the butter, sugar mixture right? Thanks so much! I’m making these tonight for a party tomorrow! Happy Halloween! I’m always for a good chocolate cake or cupcake. I’ve featured this recipe on my blog, hoping that you don’t mind, but if you do, please contact me and I’ll remove it. All the best. I’m so glad you love my chocolate cupcake recipe. It is my family’s favorite, too!